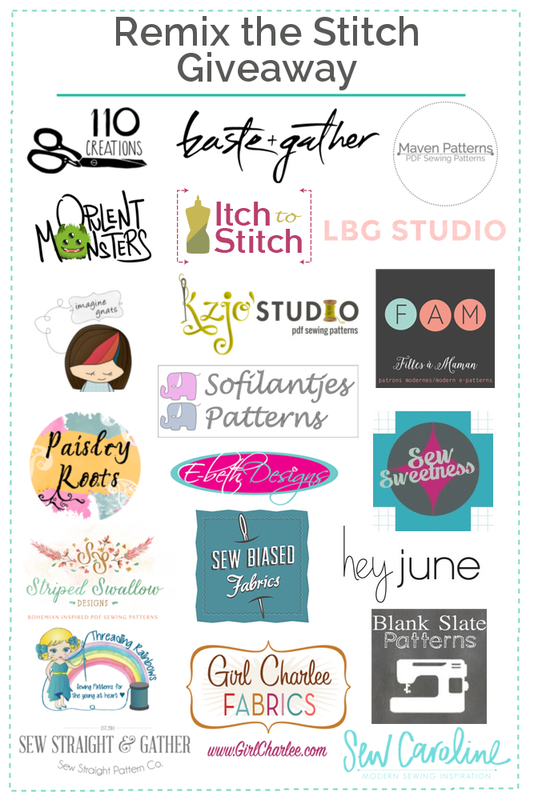 First and foremost I want to say that I am so excited to help kick of this blog tour and I want to give Kimberly at Straight Stitch Designs a huge thank you for including me in this very special event. 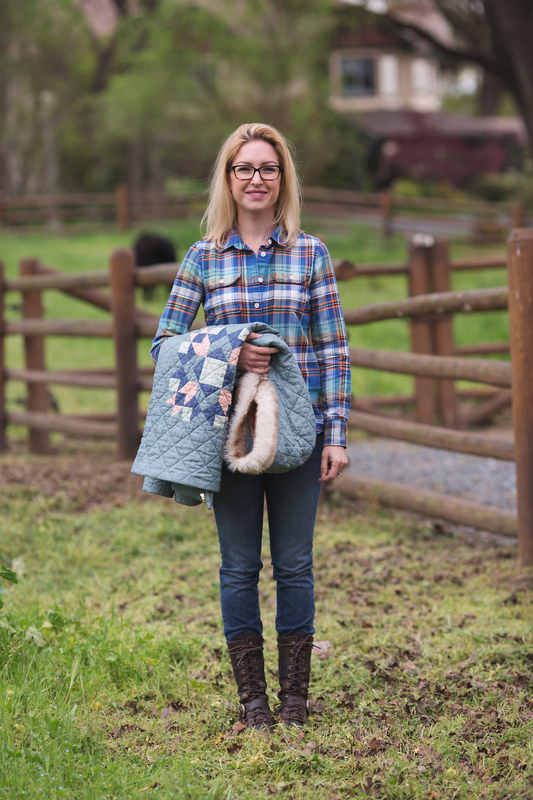 I have watched with admiration over the past year as she has started her business and turned out high quality patterns, one after the other. When she asked me if I wanted to be a part of this blog tour I jumped at the opportunity. The second I heard what “Remix the Stitch” meant to her, I knew exactly what I wanted my contribution to be. About a year ago I bought a knit cardigan from Anthropologie with full intention of doing a rub-off. In fact, telling myself I was going to do a rub-off was how I justified spending the money. 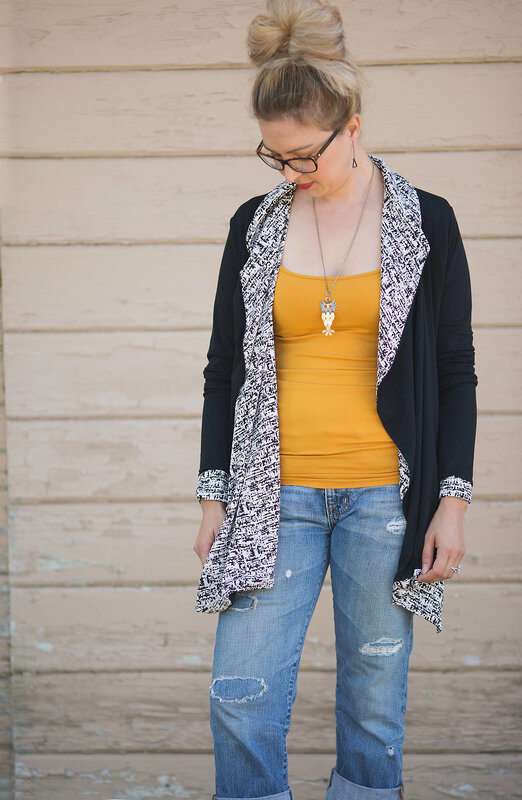 “If I buy this expensive cardigan, I can copy it and make many cardigans, therefore the price tag of this one isn’t so bad…right?” I do that sometimes, but the truth is I rarely actually follow through with the plan. This incident was no exception. So I bought the expensive cardigan and it remained expensive because I never made the rub-off. The truth is I still like that garment, however its been well loved and just isn’t looking so fresh anymore. 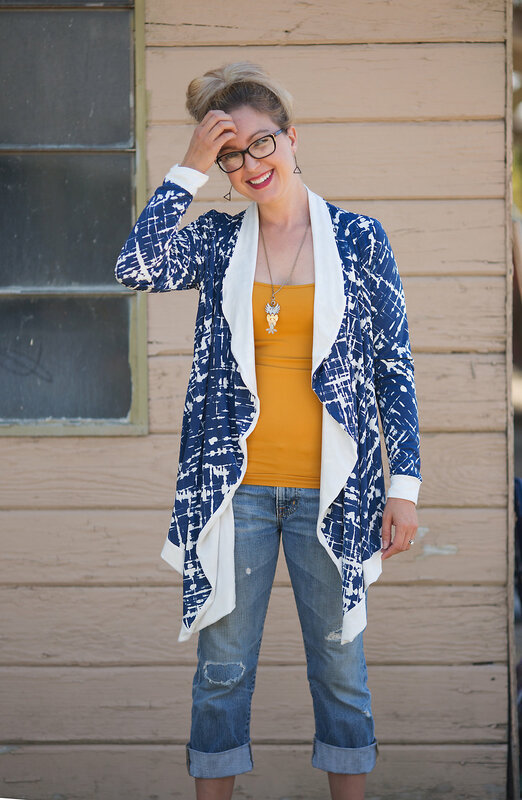 When Kimberly asked me to be a part of this blog tour I knew her Laurelhurst pattern was the perfect match for taking the idea of that Anthropologie cardigan and finally make another one like it. I could not be happier with how these turned out. I loved them so much I made three of them already!! Where I live I can wear something like this comfortably all through the winter. Maybe not if I’m spending the day outdoors but surely for running errands, school pickup, grocery shopping and all the regular in-and-out of the car things that a mom has got to do. There is no doubt in my mind that these and others like it will become standard wardrobe staples for me during the colder months. I purchased all of the fabrics used here from Joann Fabrics. 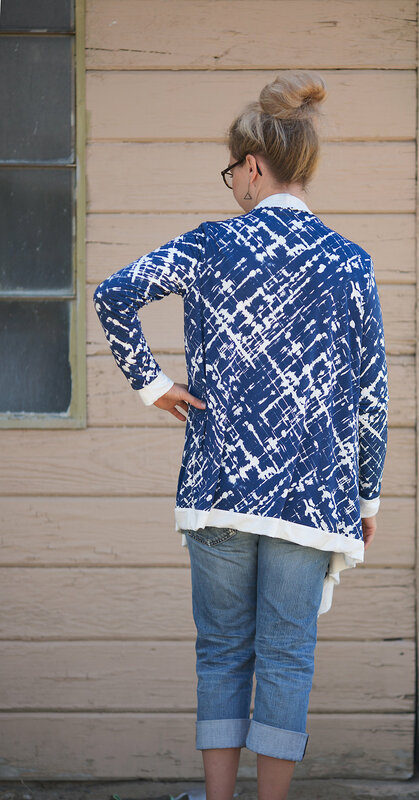 While the outer part of both garments are knit, I tried the lining in both a knit (blue and white version) and a woven (black and white version) although, I prefer the all knit version best. I’m sure my preference has something to do with the fact that both the lining and the outer of the blue version are rayon which gives it a lovely heavy drape and a nice soft hand. For the black version I used a synthetic silk-type fabric for the lining. If I make this again with a woven lining I intend to make the lining in a size or two larger than the outer just to give it a little more ease through the back and in the sleeves. It’s perfectly wearable as it is but comfort and mobility is key when you have a toddler to chase around. Kimberly has a fantastic lineup of bloggers participating in this First Birthday Extravaganza and of course there’s an amazing giveaway. Check out her blog in the days to come so you don’t miss out on any of the great things she has in store. Click on the image below for a direct link to her rafflecopter and check out the schedule below to see who’s coming up in the days ahead. I guarantee there will be no shortage of inspiration to spark your own creativity and help you ‘Remix the Stitch’ in your own creative way. 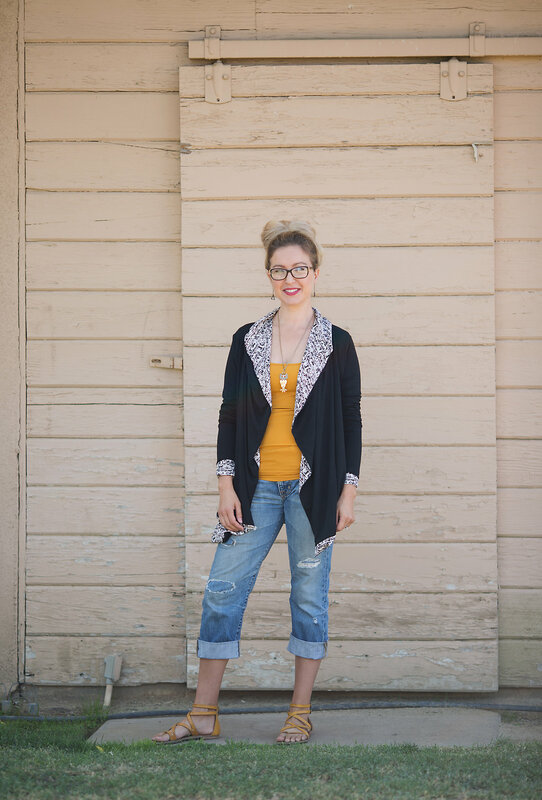 What a comfy looking cardigan–great job! Thank you Lisa. It really is. I’ve been wearing it around my house despite the lingering heat wave where I live.